I snatched them up during the Shopbop sale a couple weeks back, and they’ve already become my favorite pair of statement earrings I’ve ever owned. Such a fun little splurge! Whether you’re on spring break or not, I hope you find a way to celebrate in the sunshine this week. Thank you for kicking it off with me here on Lonestar Southern! Those earring are so fun! I love them with that all white outfit :) Have fun in Mexico girl! Those earrings are BEAUTIFUL. I’m worried I wouldn’t be able to pull them off, but they’re amazing! Your outfit is lovely, but can we talk about the lighting!? It’s perfection. Gorgeous photos, gorgeous girl ? Those earrings are absolutely adorable! I love them! Wow you look gorgeous here Kate! This white look really brings out your tan too! Love the fun earrings :) if you don’t mind me asking, what camera/lens did you shoot with for this outfit? It just looks so put together! Thanks so much! 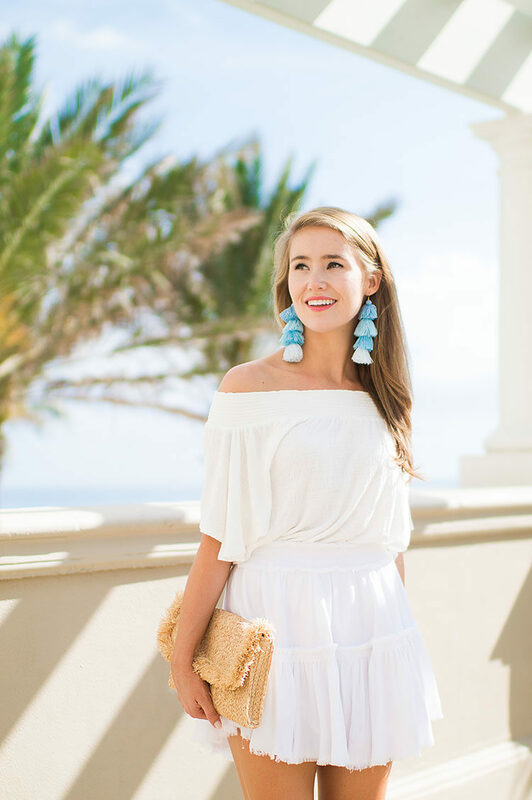 These tassel earrings are so fun- I love how they make such a statement for your outfit!